Made with the most concentrated amount fresh Aloe Vera leaves on the market, this cooling gel forms a protective barrier that helps retain moisture and promote healing. Cooling soothing gel from nature's miracle plant of the ages. Made from fresh Aloe Vera leaves. Forms a protective barrier which helps retain moisture and promotes healing. 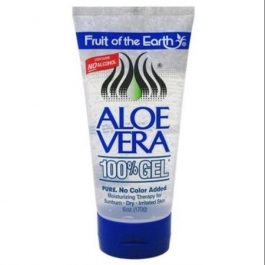 Non-oily moisturizer provides effective relief from sunburn, minor burns, skin irritations, insect bites, chafing, itching, dry skin. Fragrance free. No color added. Quickly absorbed. Will not stain. Apply liberally to sunburned or irritated skin as needed.